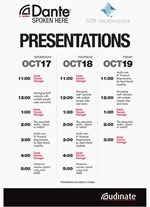 AES Presentation: The Networked Studio: A Dream or Reality? The annual AES Show in New York is always a highlight in the Pro Audio calendar. We will be at the show again this year, and we will bring along a brand-new Dante expansion card for AX32 that is bound to change the game in applications where several, otherwise independent Dante networks, need to be connected. The DAD AX32 has already become widely recognized as a Swiss Army Knife for converting and routing between audio formats. Now, we sharpen that knife once again by adding massive Dante/AES67 IP Audio bandwidth. AX32 comes with support for 64 channels of Dante IP Audio when you unbox it, but in an effort to meet demand for an even higher channel count, we now introduce an optional expansion card that adds another 128 channels to the digital audio-routing matrix. Further, with eight slots available for expansion cards, you could ultimately have as many as 1,088 Dante/AES67 channels, including the 64 channels that comes as standard, at 48 kHz. The new Dante expansion card also offers sample rate conversion as well as dual redundancy network ports in order to maximize reliability, reducing your risk of losing valuable production time. The new Dante expansion card introduces per-card sample rate conversion, which allows several independent audio networks that run on individual clocks and sample rates to be connected to and unified in a single DAD AX32. Simply adding more Dante channels may sound trivial, but once you start to think about the actual problems that this amount of channels in combination with independent sample rate conversion is capable of solving, it’s a quite significant improvement of the overall system. For instance, the new Dante card will immediately be able to solve real-world challenges when working with Dolby Atmos Mastering Suite, as well as in recording studios using e.g. the AVIOM monitoring system, but would like to record at a higher resolution. Further, the internal sample rate converters on the new Dante cards have been developed in-house. We started out developing converters and have never compromised on the quality of our AD/DA converters – or internal sample rate conversion within the digital domain. ‘Digital’ is part of our brand name and we take that very seriously. The Networked Studio: A Dream or Reality? 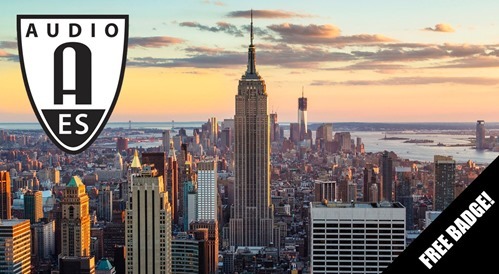 During the AES show in New York, our Business Development Manager, Jan Lykke, has been invited to present his 'The Networked Studio: A Dream or Reality?' keynote on the Project Studio Expo Recording Stage. In the program it is listed as 'Session PSE11'. 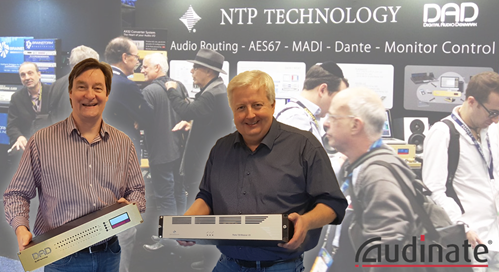 The presentation will discuss the use of networked audio technologies, such as Audinate's Dante protocol and AES67, in music and audio post-production studios. It will look at pros and cons of networked technology, what benefits and challenges you may run into, and illustrated with real-life examples. Further, the topic of latency on in an IP Audio system will also be covered. Throughout the show, we will host a series of sessions along with our 'booth neighbors' from Audinate. 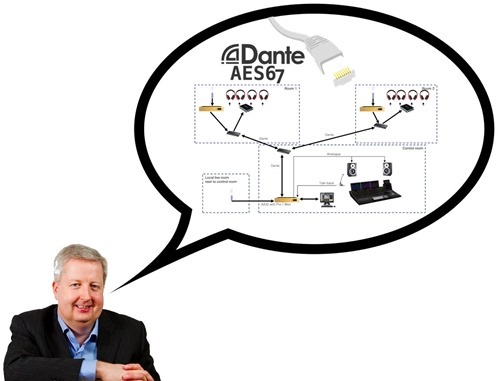 Unsurprisingly, the main theme for these technical presentations will revolve around Dante / AES67 IP Audio solutions. This obviously includes our AX32 and the new Dante Expansion Card, but in a general Dante context with a view to real-world applications and solutions, which also spans details regarding Dante Domain Manager. If you are at the show, come by Booth #331, as we will host presentations all days every hour, on the hour! Please click on the schedule to the left to see a larger version. Our new SPQ Speaker processing expansion card for AX32 has just started shipping recently, and we will of course have an SPQ card installed at the booth for you to experience and explore. Overall, it is part of an advanced monitoring solution for AX32 that also covers the MOM (Monitor Operating Module) hardware monitor controller and the Pro|Mon license that unleashes the powerful monitor control features of the DADman software. Attend the AES 2018 Exhibition for FREE! We're happy to be able to offer you a free badge that is good for the exhibition hall PLUS all Special Events, the Project Studio Expo and the Live Sound Expo - a $75 value at onsite registration pricing. All AES New York 2018 registrations include the co-located NAB Show New York exhibition hall and Core Sessions package - also a $75 value.